Stay calm: It is going to be busy, frenetic, loud and crowded (not unlike a busy shopping day at a popular Western mall). If you are uncomfortable with crowds or confined spaces, this may not be the place for you. But if you are willing to brave the bazaar, be prepared to take deep breaths. Don’t put time restrictions on yourself – set a leisurely pace and don’t feel rushed by the shop owners (who beckon enthusiastically to passersby). Learn to haggle: There are many places in the world where you will be expected to argue for a good price. Some people hate haggling. Some people think it is thrilling and, if you’re good at it, you can get some really great deals. Bazaar shop owners are masters of this craft and they see thousands of tourists a day. Be aware that the friendly questions they ask you are intended to case out your worth and set the bargaining parameters – where are you staying? What cruise ship did you arrive on? What country are you from? Feel free to put on a bit of a show, fabricate your life story, even dress the part. Never accept the first price and be prepared to walk away if things are not going your way. Spot the fakes: You are not likely to find real luxury brand items in the bazaar; most of what you will see are knock-off designers and imitations. Imitations can make great gifts for your teenaged cousin and many times they are very convincing – why not pick one up for yourself? No one will know the difference! That said, don’t be fooled into paying a high price for something that is almost certainly not genuine. Don’t drive: Bazaars can be located on busy or hard-to-access streets and most do not have parking lots nearby. Take transit, a taxi or arrange a tour that will drop you at a bazaar, allow you shopping time and return you to your lodgings. Have a bite to eat: Bazaars often have food stands and coffee shops, sometimes located at entrances with benches. Don’t forget to try local flavours and give yourself a break from the noise and crowds. It’s easy to get swept along from stand to stand, but if you stop for a rest you’ll enjoy yourself more. 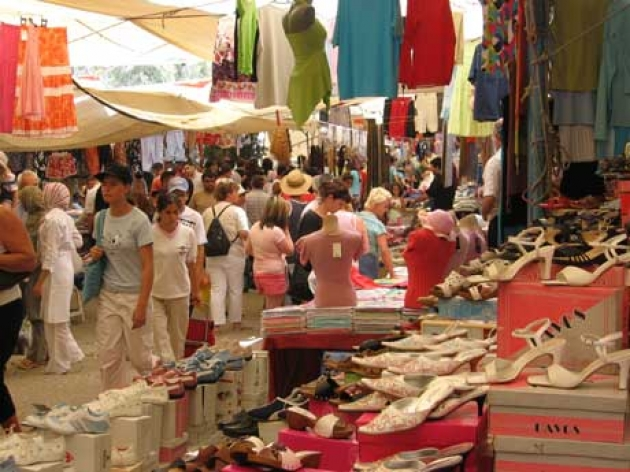 Most bazaars also have portable washrooms or nearby facilities for shoppers. Protect your valuables: Bazaars are busy places, full of tourists and this can make you a target for pickpockets. Leave your valuables at your hotel and bring only what you need. Wallets in back pockets or large, open purses are easy to steal. There are many options for travel-safe pouches that can be worn under clothing, these are a good option for protecting your cash.